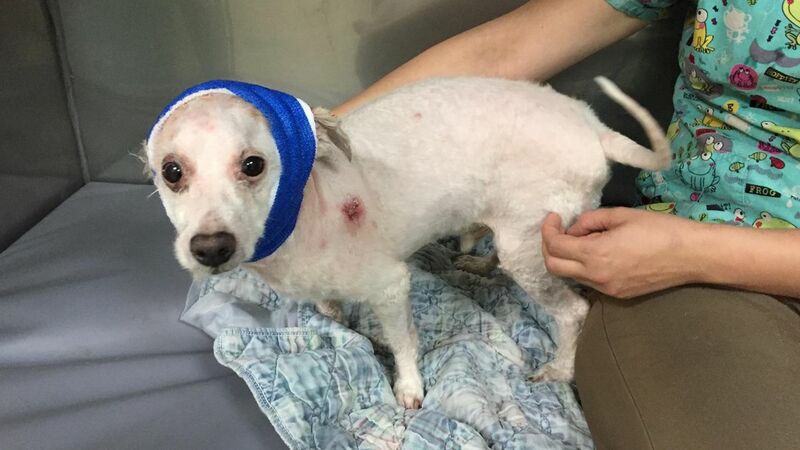 PUTNAM COUNTY, New York (WABC) -- Putnam County's Society for the Prevention of Cruelty to Animals is investigating a disturbing case of animal abuse after a severely neglected and beaten dog was found on the side of a road in Carmel Tuesday. A good Samaritan found the tiny male poodle mix alongside Drewville Road. He was in such bad condition that he was believed to have been hit by a car. The passerby took the dog to Roosevelt Veterinary Center to be examined and treated. The hospital staff, who named the dog Douglas, said that 5- to 8-year-old animal suffered years of neglect and abuse. Douglas was found with multiple health issues and injuries, including an intra-abdominal tumor and bleeding tumor on his head that was filled with maggots. His fur was extremely matted and soiled, and his nails were so long that they curled and made it extremely difficult for him to walk. "This is the result of extreme long-term neglect," veterinarian Dr. Allison Glassman said. A $1,000 reward is being offered for information leading to the arrest and conviction of the person or persons responsible. Anyone with information on the dog or the owner is asked to call the SPCA's 24-hour cruelty hotline at (845)520-6915. All calls can be kept confidential. For more information on the SPCA, visit their website at SPCAPutnam.org.